Grabbed a chunk of burn pile cherry that I sawed down a few years ago. It turned out to have some interesting grain. One coat of Howard Butcher Block Conditioner – I’m going to add a few more coats. Looks great Ron, I wish I could turn, but I’m just no good at it. Very nice == a GREAT job +++ Great save too. Bowl looks good Ron, wood looks good too. Maybe there’s a few snowmen, spatulas, and mushrooms hiding as well? This is a beautiful bowl and the wood is so nice. Thanks guys – and John – yes there will be a bunch more cherry things in the future. I have a gazillion board feet of this stuff. Good eyes! I have found many good pieces which were almost thrown into the burn pile. Splitting one’s own home-grown wood is often rewarded with spalted pieces. You can see how much the spalting changes just in the width of the saw blade’s kerf. 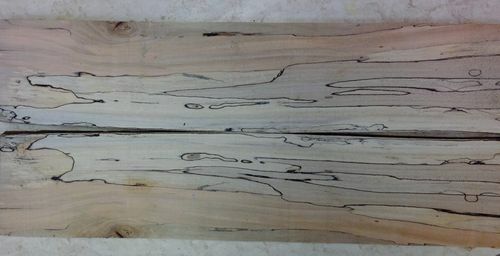 This is book matched spalted hickory from my place.